The increasingly prolific Mistress katherine adds the following to her Challenge entry hoard. 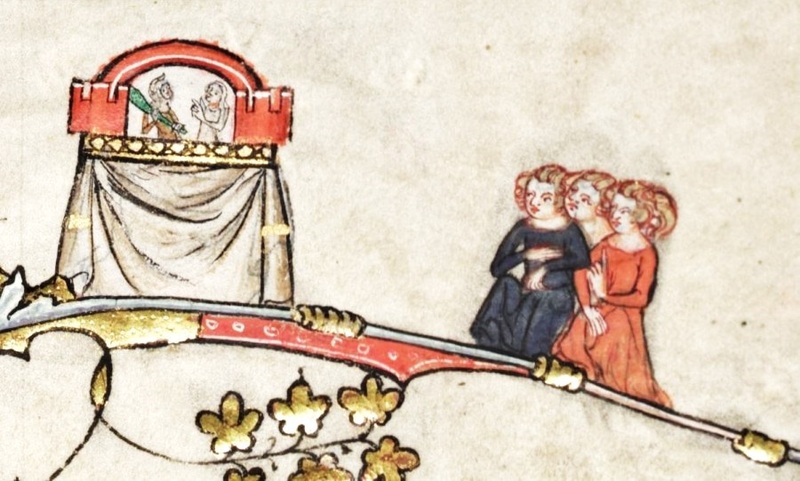 Firstly, a medieval dog collar for the category Togs Togs Undies! This is a dog collar, based on the comments by Gaston Phoebus in 15C Book of the Hunt, and from illuminated manuscripts. Common features: red velvet, embroidery with gold thread or wire, a leashing ring, single eyelet, rumbler bells, studs of various kinds. 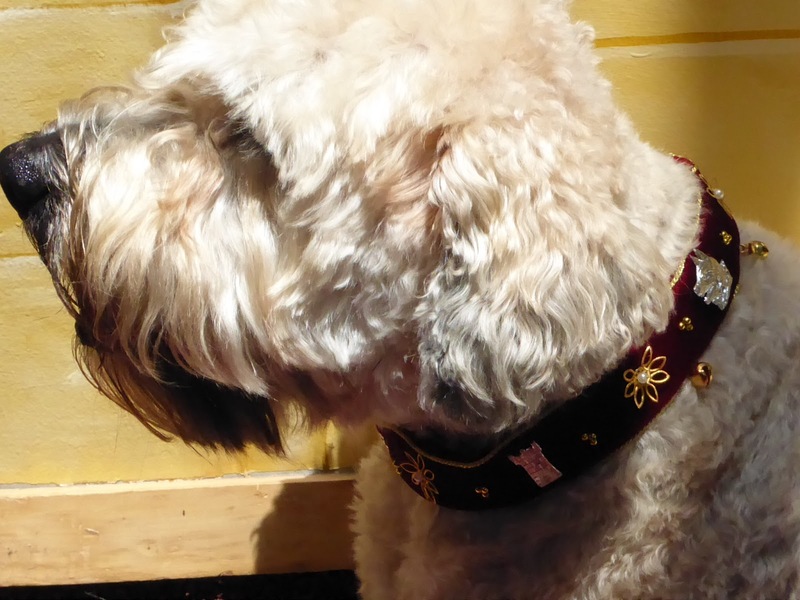 Modelled by Mercalli ("what a good dog!"). Here's a good site with lots of doggy and hunt info. 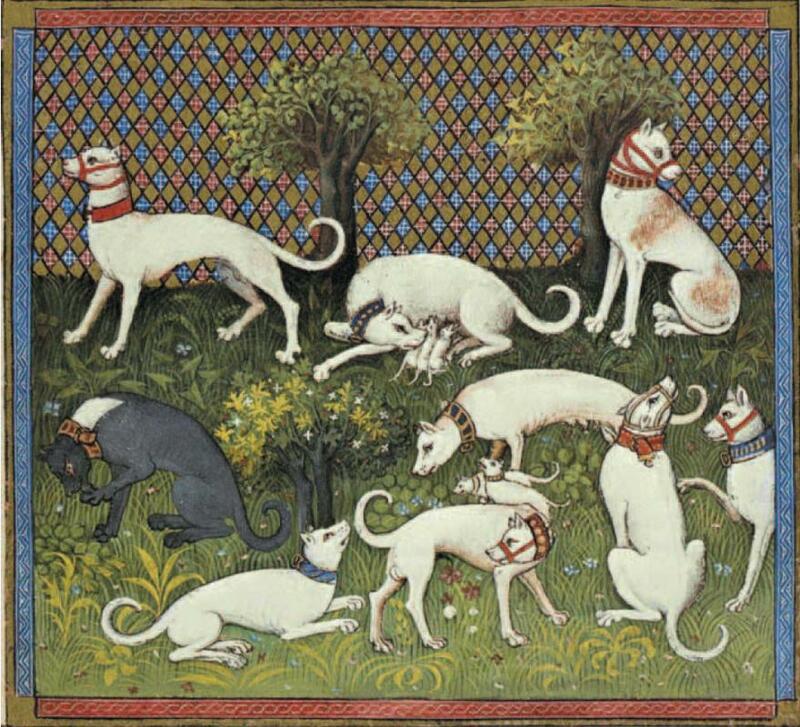 And a good image from Gaston Phoebus of white pointy-eared dogs with collars. 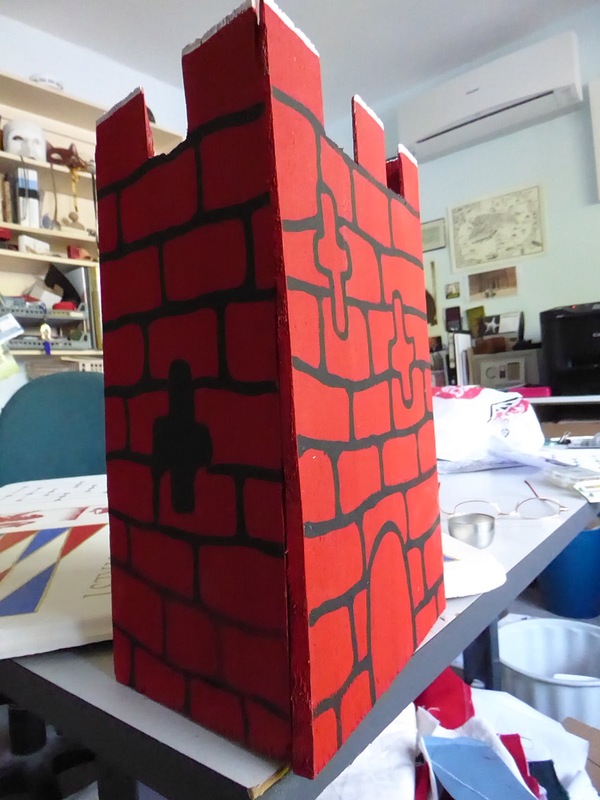 The next entry is new towers for the puppet theatre at Canterbury Faire, made from scavenged cedar shingles and painted up like 14-15C examples. These are for the category Out Of Your Comfort Zone, which katherine assures us she was. This took me out of my comfort zone -- I had to use power tools and -- worse-- ask an unknown neighbour for permission to raid his construction skip. I also looked at the shingles after I'd painted them and realised that circular saw marks were clearly visible, which Master Edward confirmed was a no-no to proper woodworker eyes, so I flipped them over and sanded them down to start again. 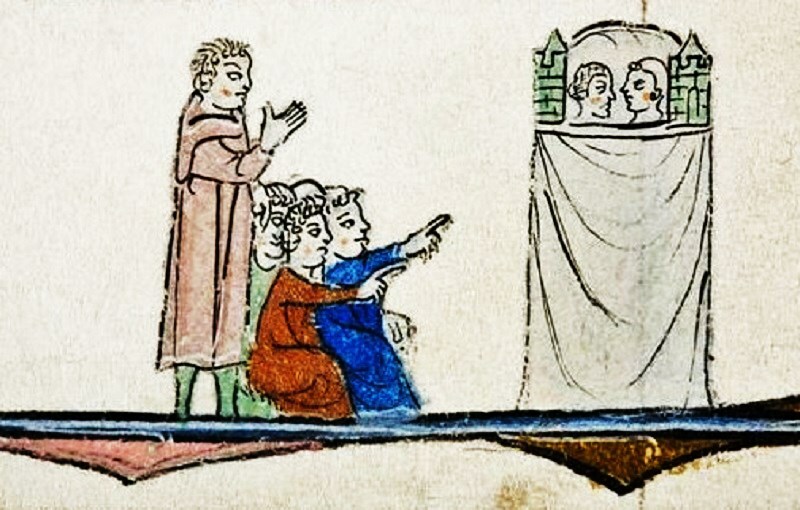 Some examples of puppet theatres in manuscripts can be found at the Bodleian here and another example here. Finally (at least for now!) 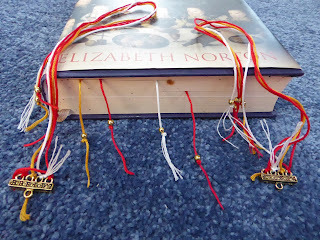 - bookmarks in baronial colours for the largesse chest. From the 12C onwards, cords, threads of strips of leather were attached to beads, buttons and similar shapes to make stand-alone bookmarks. 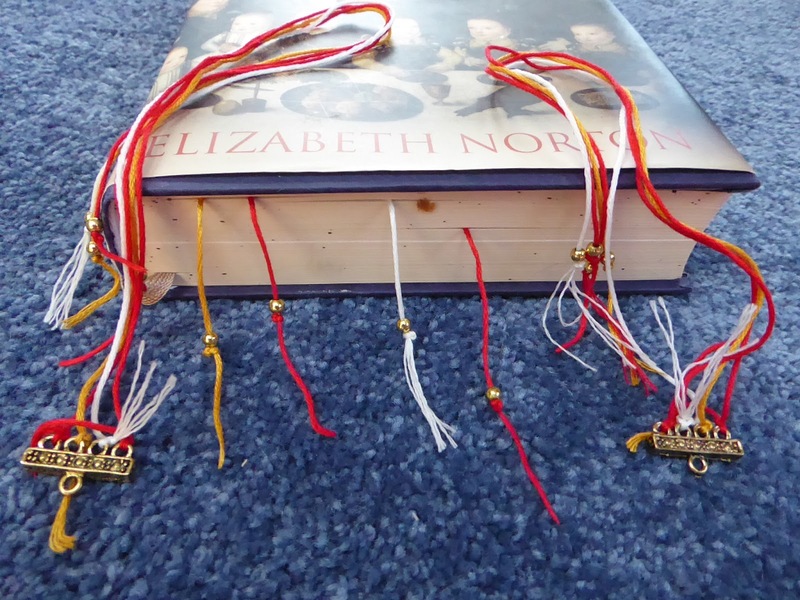 Multi-threaded bookmarks were particularly popular amongst the clergy for flipping back and forth in service books. These are for the category Fly The Colours, but they also meet the requirements for Give What You Get. More information about these from katherine here. A delicious and delightful entry from Dona Isabel Maria - Marchpane! This is for the categories Back To Basics, Show Us Your Arms and Fly The Colours. I began with a copy of 'The English Hus-wif' by Gervase Markham, a packet of raw almonds, a packet of caster sugar, a bottle of rose water, a mortar and pestle and a quiet evening. Some time later I had 'searced' (powdered) sugar. Some considerable time after that, I had a lump of raw marchpane, two sore arms and a strong resolve to buy a spice grinder. I followed the rest of the instructions (kneading, rolling it out, adorning it, washing with rose water etc) but with a few modifications. 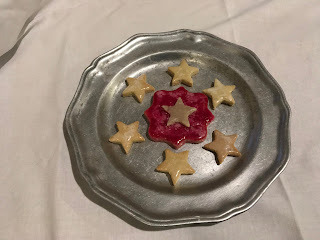 I ignored the wafers (not having any) and decided to have a go colouring the 'ice' (icing) using plausibly period ingredients. The red was colour was created with a couple of drops of beetroot juice in some powdered sugar and rose water, while the green came from boiling up some rosemary and parsley from my garden. The decorated marchpanes were then baked in a relatively cool oven until they were just beginning to colour. However, the colours did not really develop as I had hoped, so I applied additional coats. 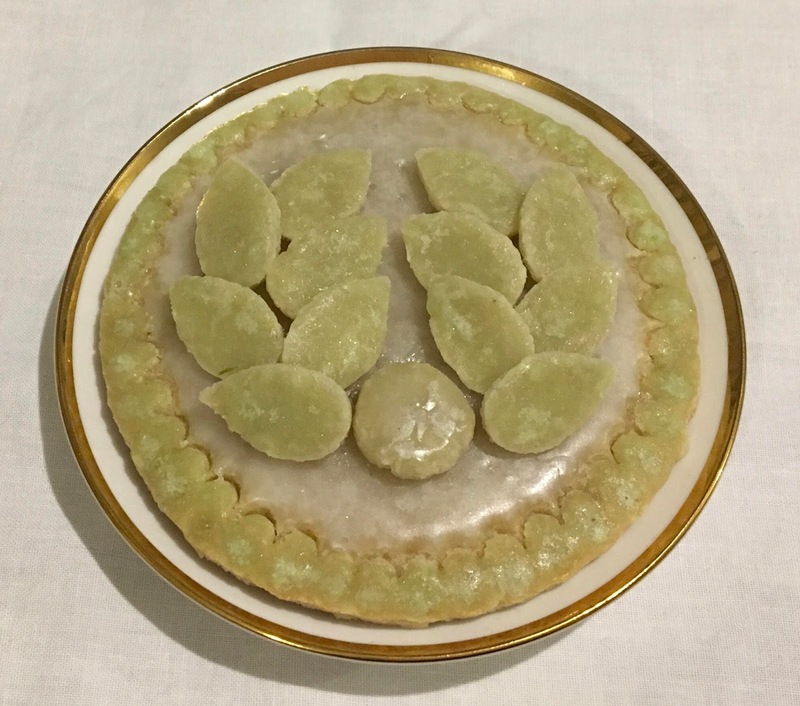 I tested the differences between baking it before icing it, and icing the raw marchpane, as well as the difference between letting it dry between coats and baking it between coats to see if there was any appreciable difference I could use in future experiments. Taste: the finished items were taken to a household sewing day, to add to the lunch table. The general consensus was that the marchpane was tasty, even for those people who actively avoid modern marzipan. I personally found it fairly irresistible and hope to experiment further in the future.